First reported in 1954 by Brews , symptomatic endometriosis of the diaphragm is rare, with less than 30 cases reported in the world's literature. Most of these cases are contained in two series [2, 3]. The right diaphragm is involved 27 times more frequently than the left. Bilateral disease is rare, occurring in only two of 28 cases. The age range of women with symptomatic diaphragmatic disease is 19-43, with an average age of about 34 years. There can be a delay of several years in diagnosis after symptoms appear. Symptoms can be classic and consist of ipsilateral chest and shoulder pain which first appear during menses. Symptoms may extend earlier before menses as time passes, with some patients experiencing chronic mild symptoms with severe aggravation before and during menses. The pain can radiate up the neck or into the arm on the affected side and may feel like a muscular type of ache. When the pain is most severe, it can cause pain with breathing or lying down. Rarely, a patient may have to sleep in a sitting position and most will have to limit daily activities when the pain is at its worst. Heat, massage, and analgesics are used in an effort to relieve the pain. The diagnosis of diaphragmatic endometriosis is initially suggested by symptoms, since imaging tests will usually be negative. Pleural effusions and pneumothorax are rarely diagnosed in these patients . Surgery is necessary to confirm the suspicion of diaphragmatic disease, and this can be done laparoscopically. It is necessary to view the entire surface of each hemi-diaphragm. A laparoscope placed through an umbilical port can view only the anterior portion of the right diaphragm because the large volume of the liver hides the posterior diaphragm from view (Fig. 1). While small, flat 'sentinel' lesions may be visible, the most highly symptomatic lesions will be located on the posterior half of the diaphragm . The left diaphragm can be seen virtually in its entirety. The operating table can be placed into reverse Trendelenburg position to allow the liver to drop away from the diaphragm, but still the entire posterior diaphragm will not be seen in all patients. The best way to view the right posterior diaphragm in its entirety is to insert a 5mm port subcostally in the mid-clavicular line (Fig. 2). This allows a 5mm laparoscope to be advanced much further over the dome of the liver than a laparoscope in an umbilical port site so that the entire diaphragm can be viewed (Fig. 3). 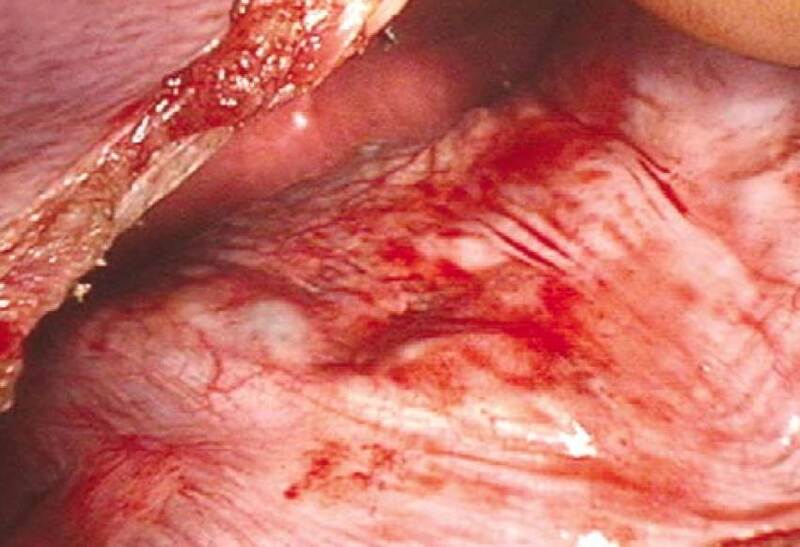 Symptomatic endometriosis of the diaphragm exists as single or clusters of nodular lesions ranging up to 1.5cm individually, spread across up to 10 cm of the surface of the diaphragm, usually in a swathe somewhat parallel to the posterior chest wall. 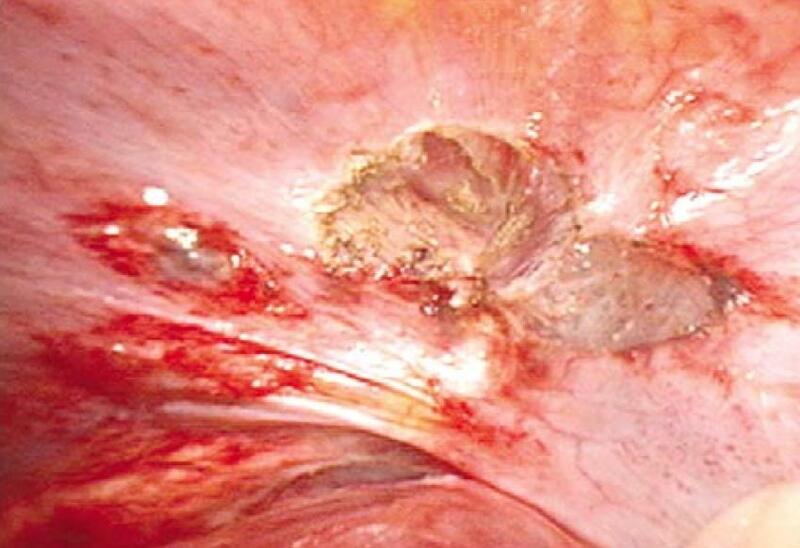 Some lesions will exhibit adhesions to the adjacent liver surface (Fig. 4). 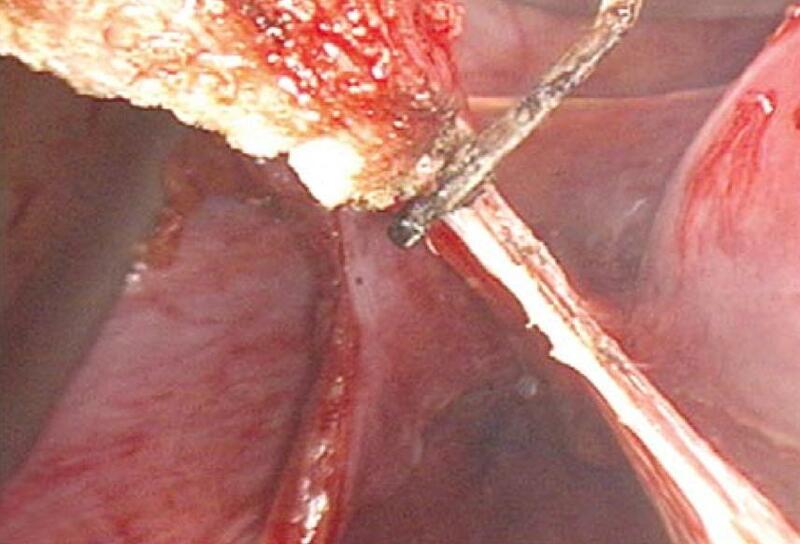 The right hemidiaphragm and liver seen with a 10mm laparoscope maximally inserted through an umbilical sheath. The anterior and mid-diaphragm can be seen, but the posterior diaphragm is not visible. Exterior view of a 5mm laparoscope inserted just inferior to the right costal margin in order to visualize the posterior diaphragm. Laparoscopic view showing how much farther over the liver the 5mm laparoscope can advance using the subcostal incision. The entire diaphragm can be seen. Endometriosis of the right leaf of the diaphragm with adhesions to the liver surface. Treatment requires laparotomy and diaphragmatic resection for the best results *. Medical therapy has been ineffective in most cases where it has been used, and castration may not relieve symptoms in all patients. The surgical procedure is straightforward. If unilateral disease is present, a subcostal laparotomy incision is used on the involved side. If bilateral disease is present, a midline epigastric incision is used. A self-retaining retractor is applied to the wound, and the liver is manually retracted inferiorly (Fig. 5), and the falciform ligament is lysed. 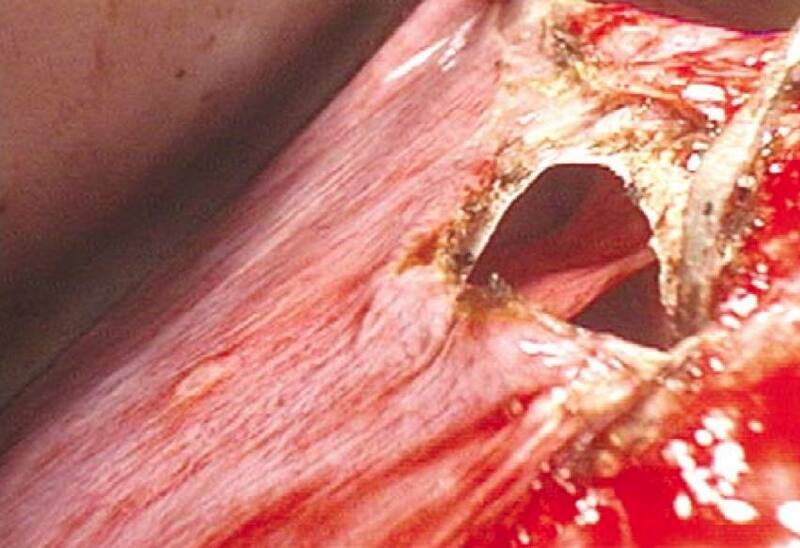 Superficial lesions can be removed by partial thickness resection using electrosurgery or scissors (Fig. 6). Since the diaphragm is only a few millimeters thick, and since symptomatic nodules exceed the thickness of the diaphragm , full-thickness diaphragmatic resection will be necessary. Long Allis clamps are used to grasp the affected diaphragm and pull it away from the underlying lung (Fig. 7). The pleat of tissue created between the jaws of the Allis clamp is incised next to the nodular disease (Fig. 8), using electrosurgery or scissors. The normal diaphragm alongside the lesions is then incised on both sides of the lesions (Fig. 9) until the full thickness of the diaphragm is penetrated (Fig. 10), and the segment of involved diaphragm is resected (Fig. 11). Occasionally the full-thickness diaphragmatic lesions (Fig. 12) may be adherent to the underlying lung (Fig. 13). Separate areas of resection are sometimes required for non-contiguous lesions (Fig. 14). 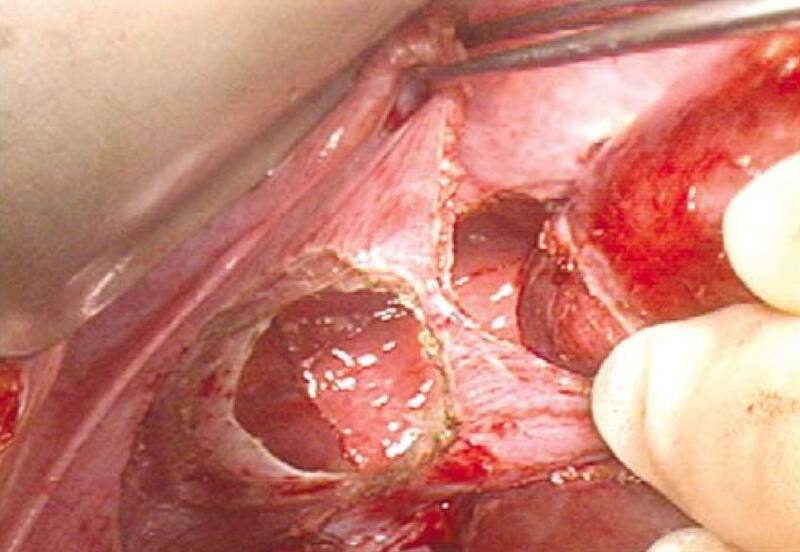 Some superficial lesions of the diaphragm can be removed by partial-thickness resection. 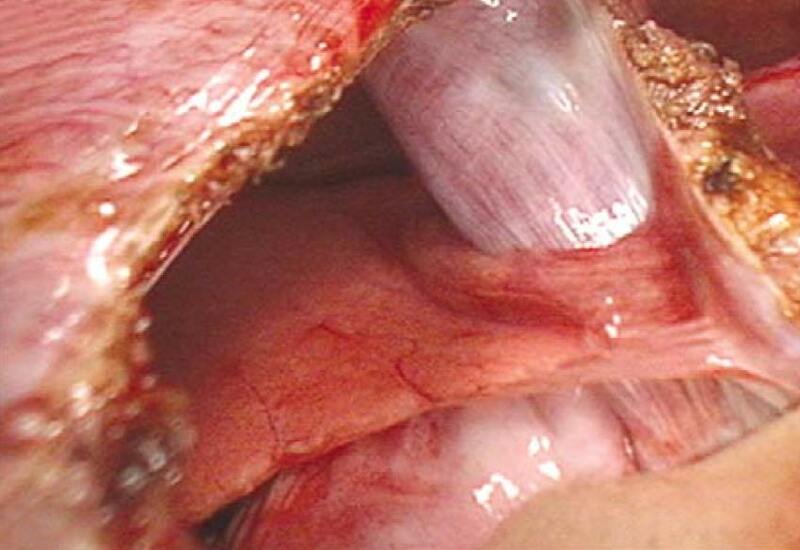 Full-thickness resection of the diaphragm is necessary to treat symptomatic disease. 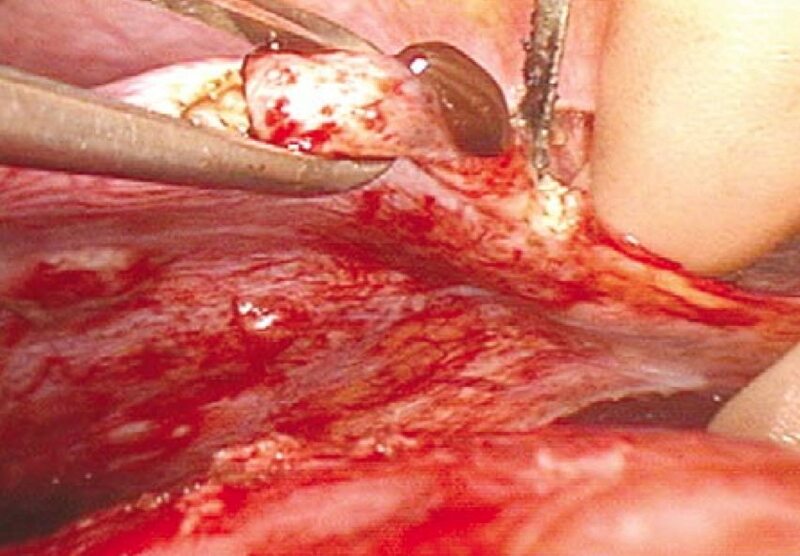 A nodule of endometriosis is grasped with an Allis clamp and pulled toward the abdominal incision while the electrosurgical pencil is ready to begin the resection. Electrosurgery is used to begin the resection adjacent to the nodule. Note that some thick chocolate-colored fluid has been forced out of the cystic lesion grasped by the Allis clamp. With the diaphragm pulled strongly anteriorly, the lesions on the right of the frame can be isolated with an electrosurgical incision alongside. 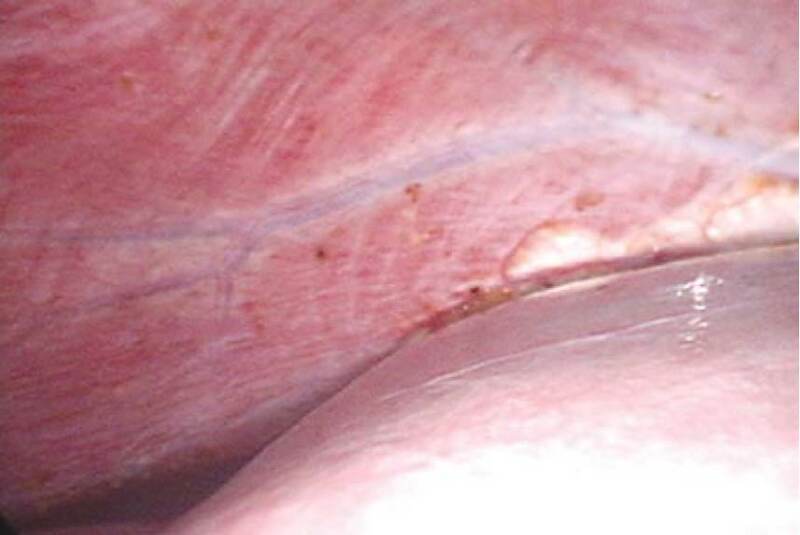 The incision quickly becomes full thickness since the diaphragm is so thin. The base of the right lung is seen through the defect. 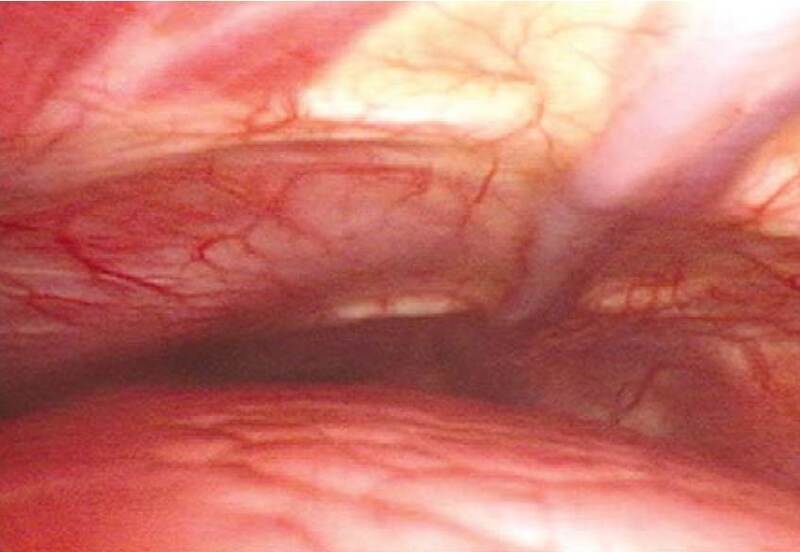 The piece of diaphragm carrying one area of endometriotic lesions is almost completely excised. The pleural surface of the diaphragm can be examined after full-thickness penetration has occurred. Hemorrhagic neovascularity and nodules of endometriosis are seen penetrating the full-thickness of the diaphragm. The base of the right lung is adherent to the pleural surface of the right diaphragm due to the inflammation of full-thickness endometriosis. After complete removal of all diaphragmatic endometriosis by full-thickness resection, one or more defects will have been created. The laparoscope can be advanced into the chest cavity (Fig. 15) to examine for thoracic endometriosis, which would rarely coexist with diaphragmatic endometriosis. 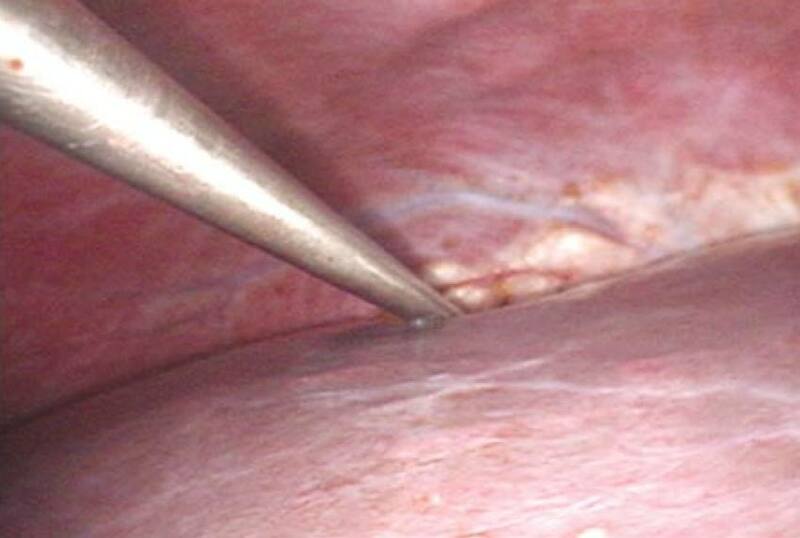 The diaphragmatic defects are closed using a running permanent suture. Before the last suture is tied, a soft catheter is placed into the chest cavity and the anesthesiologist maximally inflates the lungs while the catheter is removed and the suture tied. This eliminates the bulk of any pneumothorax. Postoperative chest x-rays are unnecessary in asymptomatic patients and would likely show a small pneumothorax. Postoperative fluoroscopy of diaphragmatic function was normal in two patients , and there seems to be no morbidity from diaphragmatic resection, especially given the severe symptoms present before surgery. The laparoscope can be advanced into the thorax for transdiaphragmatic thoracoscopy. The anterior surface of the right lung is seen in the bottom third of the frame. The parietal surface of the right thorax is seen in the top half of the frame. The vessel is the right internal thoracic artery, which is also known as the internal mammary artery. This artery is a continuation of the inferior epigastric artery which is well known to pelvic surgeons. 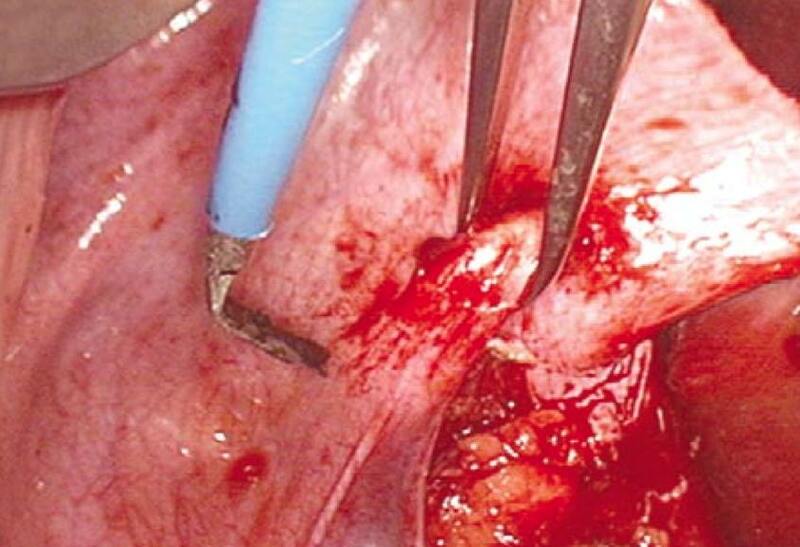 Symptomatic relief following diaphragmatic resection approaches 100% , and is much more effective than laparoscopic laser vaporization of endometriosis through an umbilical port . The lower symptom response seen with laser vaporization may be due to incomplete visualization of the diaphragmatic lesions and incomplete destruction. Indeed, since 100% of the cases of symptomatic diaphragmatic endometriosis in one series  were associated with full-thickness disease, thermal ablation techniques seem contraindicated. 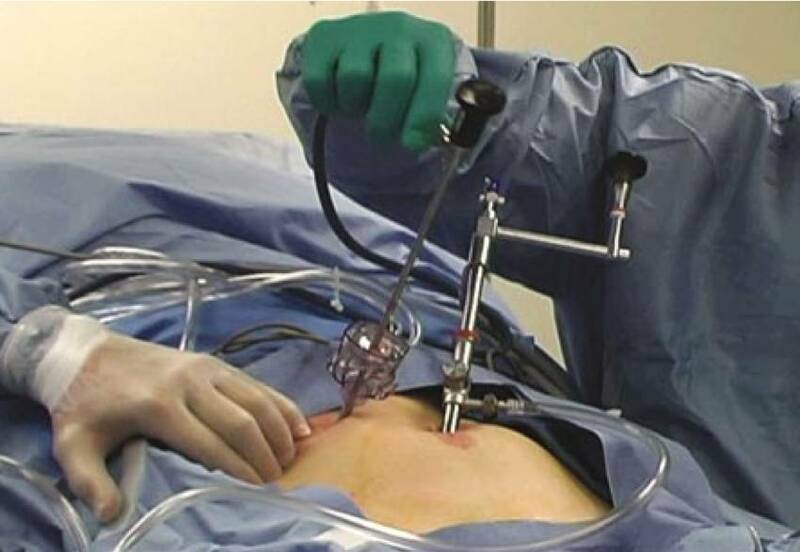 * Please note, since this paper was written and published, advances in laparoscopic techniques now often allow surgeons to treat diaphragmatic disease laparoscopically instead of via laparotomy. This paper describes the techniques used to excise diaphragmatic disease via laparotomy. If you are facing surgery for the removal of diaphragmatic disease, please discuss your options with your surgeon. Brews A. Endometriosis of diaphragm and Meig's syndrome. Proc Roy Soc Med 1954;47:461-8. Nezhat CH, Seidman DS, Nezhat F, Nezhat CR. Laparoscopic surgical management of diaphragmatic endometriosis. Fertil Steril 1998;69:1048-55. Bhaumik J, Hefni MA. Endometriosis of the liver and diaphragm: is the diagnosis often missed? Gynaecol Endosc 2002;11:155-8.